Don’t even think of showing up in a blue tuxedo with a ruffled shirt; this is no time to create a visual callback to Adam Sandler’s character in The Wedding Singer. Don’t hesitate to contact the bride or the wedding coordinator to inquire after dress suggestions, as every wedding has its own personality. Unless you’re also officially part of the bridal party, don’t rent the same outfit as the groomsmen, but it never hurts to rent a tuxedo from the shop catering to the wedding party. You can find a pocket square or tie to match the bridal colors to complement the wedding’s design scheme. If you’re the Mistress of Ceremonies, the same advice follows. Which bridal shop sold the bridesmaid dresses? Often, larger Sydney and Melbourne bridal chains sell dress and accessories within a similar range of color and style themes. You can find a dress style that hints at the bridal theme, giving you a sense of “wedding party authority” without looking like you’re crashing the bridesmaid brigade itself. Well organized weddings move along on a planned timeline. Ask the bride or wedding planner to send you a copy of the day’s itinerary, and an updated version the day before the event. Ask them to make notes for when they want you to step up and make announcements and speeches, so there is no confusion. Your greatest allies are the other vendors. A skilled wedding MC will confer with the event photographer to ensure everyone’s in place (including the pros) when the bride and groom arrive at the reception, have their first dance and cut the cake. 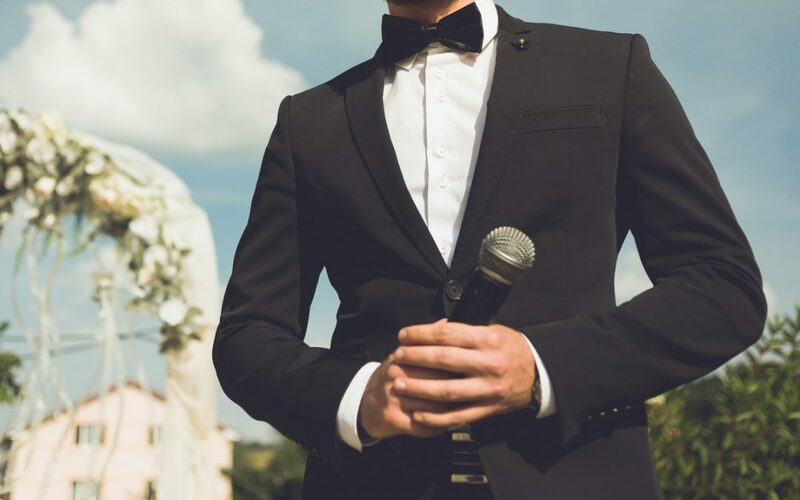 If you plan on making a career as an event entertainer in larger markets such as Melbourne and Sydney, you’d do well to make sure the wedding singers, videographers, and photographers don’t miss their cues. Brides often book their photographers early in the process, and as wedding photographers are involved in every part of the day, you can bet their referrals can make or break an event professional’s career. Missed photo opportunities are a huge disappointment, so help keep everyone on pace when you’re about to announce significant moments during the reception. Don’t announce a special dance when the wedding singers are about to give their voices a break. Check with the wedding band to make sure everyone’s ready, and don’t be afraid to touch base to make sure they haven’t made adjustments to their set list. Will you use their microphone and audio equipment? If you’re not bringing your own, you may want to check in advance with the band to make sure it’s okay to borrow theirs and to get a quick tutorial on their specific equipment. Nothing is worse than an MC who is completely off-the-mark when talking about the happy couple. Insist on getting to know the bride and groom’s story. How did they meet? What’s “their” song, and when will the wedding band play it? What tone do they want you to convey? When booking a wedding, or agreeing to be the announcer for your friends, you may want them to fill out a questionnaire to help you better personalize your routine. Ask for a clear definition of your expected role…and rock it! As the MC, you may take on the duties of a “day-of” wedding coordinator. If you’re booked early on in the event planning process, you might be in a position to help recommend wedding entertainment. Save your wedding couple the headache (often literally) of auditioning bands and singers by recommending Melbourne and Sydney’s most popular professional wedding band, Lily Road. Lily Road works with Melbourne and Sydney’s top professional talent, including singers and musicians who have performed with internationally headlining bands, and on popular television shows such as The Voice, Australian Idol and Australia’s Got Talent. Lily Road representatives will help your bride and groom find the right band for their personal tastes, and in the end, you’ll come out as the hero of the day. Whether you’ve been roped into the job, or you’re an aspiring professional entertainer, with a little advance preparation you’ll be ready to master the mic like a pro.